Florida Seminoles organize for 2019 National UNITY Conference – UNITY, Inc.
Several members of the Seminole Tribe of Florida met recently with UNITY’s Executive Director Mary Kim Titla to discuss initial planning of the 2019 National UNITY Conference to be held in Orlando, Florida. The group met last month at the Seminole Hard Rock Restaurant in Hollywood, Florida. Kyle Doney, UNITY Trustee, spearheaded the impressive assembly of Seminole tribal members who may serve on a Local Planning Committee. 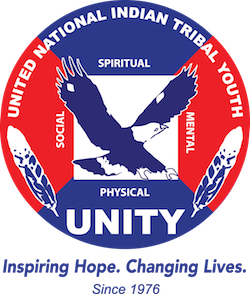 “I’m extremely excited about the opportunity for the Seminole Tribe of Florida to display some of our culture to the youth at the 2019 National UNITY Conference in Orlando, Florida. I believe the Local Planning Committee we have formed will work diligently to provide a welcoming that all UNITY attendees will enjoy. It’s my hope for UNITY and the youth of Indian Country, that we assist in exceeding all the successes from the 2018 National Conference. We have a lot of work to do from now until July, but I can’t wait to see everyone at the 2019 National UNITY Conference in Orlando!,” said Doney. UNITY looks forward to working closely with the Florida Local Planning Committee to organize what’s sure to be another impactful youth leadership conference. To learn more about the Seminole Tribe of Florida visit the tribe’s website at https://www.semtribe.com/. PICTURED ABOVE: Attending the first planning meeting at the Seminole Hard Rock Restaurant in Hollywood, Florida included (LtoR) Quenton Cypress, Janice Osceola, Mary Kim Titla, Francine Osceola, Tomasina Chupco-Gilliam, Allison Osceola, Melissa Billie, Tommie Motlow and Kyle Doney.